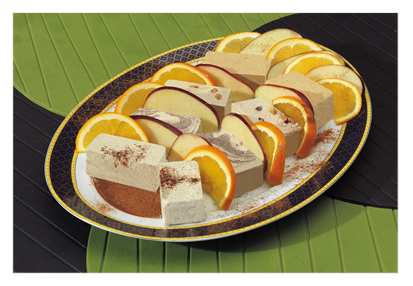 In a small Pyrex dish, arrange the slices of vanilla halva on the bottom and cover with thin slices of apple and orange. Cover the dish with aluminium foil and place in a 180oC oven until the halva melts and blends with the apple slices and juice from the orange. Transfer the halva onto a platter and garnish with cinnamon and nutmeg. Serve with white wine or retsina. A very nutritional dessert for you and your guests.